Although not a patent case, the JBLU decision has important commercial implications. JBLU is an American company that sells jeans under the C’est Toi Jeans USA brand. Of course, despite the “USA” name in the brand, the jeans are not manufactured in the US, but rather in China. That fact (‘made in china’) was noted on the inside label of the jeans. (See specimen above). 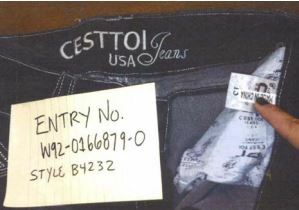 Customs officials looked at the jeans and determined that they failed the country-of-origin labeling requirement of 19 U.S.C. § 1304(a) (“[E]very article of foreign origin … imported into the United States shall be marked in a conspicuous place … in such manner as to indicate to an ultimate purchaser in the United States the English name of the country of origin of the article.”). Applying its regulatory authority US Customs created a set of regulations that indicate the use of “USA” or “America” on imports is likely to create confusion and so the country-of-origin must be made even more conspicuous (placed near the “USA” symbol and in equivalent size). However, the regulations are somewhat relaxed when USA is part of the trademark name. The Court of International Trade sided with customs officials – that JBLU must meet the more stringent standard (and had failed to meet that standard). On appeal, the Federal Circuit reversed. If a regulation is clear on its face, no deference is given to the promulgating agency’s interpretation, and we interpret the regulation in accordance with its unambiguous meaning. Viraj Grp. v. United States, 476 F.3d 1349 (Fed. Cir. 2007). Doing otherwise would allow the agency, “under the guise of interpreting a regulation, to create de facto a new regulation.” Christensen v. Harris County, 529 U.S. 576 (2000). The fact that a term is not defined by a regulation does not make it ambiguous and entitled to deference. Executive Jet Aviation, Inc. v. United States, 125 F.3d 1463 (Fed. Cir. 1997). On remand, the CIT will now become a trademark court to determine whether the C’est Toi Jeans USA counted as a trademark back in 2010 when the imports occurred. (Following the import, the company did apply for TM registration on the brand). The CAFC is impressive in it’s nearly compulsive drive to never defer to anyone. “Trademark” is clearly ambiguous in the statue, and Customs was clearly entitled to Chevron deference. Is the matter important enough to go up? Probably not….but emblematic (!) it seems to be…. 1.The word trademark appears in the a regulation, not the statute. 2. The CAFC is right. Trademark does not mean registered. There are plenty of unregistered trademarks, and they are often asserted in litigation under Section 43(a) of the Lanham Act and the common law. There is no ambiguity here. 3. The real question, in my mind, is which fits the scheme of the rule better. The rules, as described in the opinion, have two standards: one for general markings of country of origin (which are strict) and a more lenient one for marking that are part of a trademark. The point of these rules is to avoid misleading consumers. The logic here seems to be that consumers are less likely to be mislead by a mark that is part of a trademark (as this one was) than just a label that says “USA.” Not sure I buy the distinction, but there it is. If that is the case, then the fact that the mark is registered or not makes little difference. despite the “USA” name in the brand, the jeans are not manufactured in the US, but rather in China.